Paolo Soleri, the quixotic Turinese architect, maker and theorist passed away yesterday at 93. And while during his lifetime he may not have become a household name, he was by all measures a heavyweight among his contemporaries. His was a vision of utopia, a radical rethink of the priorities of architecture. He thought prodigiously (and wrote beautifully) about the interconnectedness of social and ecological systems in cities long before it became almost obligatory to do so. He was acutely aware of architecture’s role in shaping its societies, and his designs, pro-social by nature drawing heavily on local materials, were a direct reaction to the anti-social big-box landscapes of the postmodern world. His career-defining masterpiece, Arcosanti, was imagined from the ground up as an achievable utopia in which sustainability and social currency were to be every bit as valuable as monetary currency. 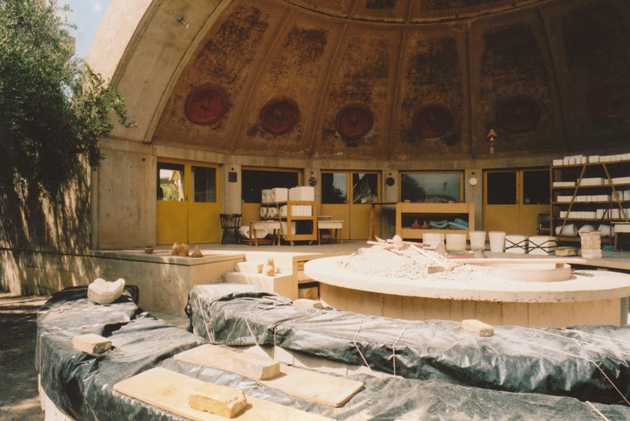 I was fortunate enough to visit Arcosanti for the first time late last summer, when these photos were taken. The breathtaking earthen Oz lies at the end of a badly washboarded dirt road off a stretch of Arizona interstate halfway between Flagstaff and Phoenix. 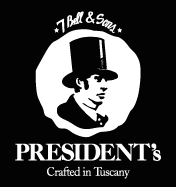 It is literally a city unto itself, set against its stunning desert backdrop, and where everyone warmly referred to its designer as just “Paolo.” It is palpably happy, optimistic place, abuzz with activity and surprisingly future forward in its artisanal ways. 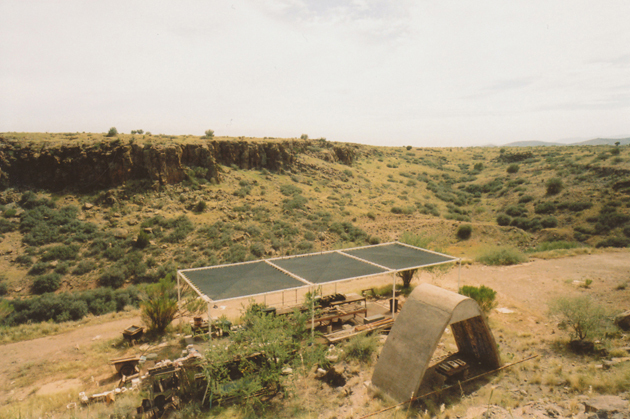 Arcosanti is still under construction today, more than four decades after its inception, primarily because it has foregone traditional models of financing and contracting. It is being built from the inside out, organically and mindfully and not-for-profit, by its own inhabitants–a scale model tucked into a corner of the complex reveals that it is as of yet only 1/4 complete. Seasonal volunteers and permanent residents work year-round, some smelting bronze for bells in the atelier to raise money for the community, others framing, landscaping or forming and laying earthen bricks. Everyone works with his or her hands and community is key. Soleri studied at the Politecnico di Torino and moved permanently to the desert Southwest in the 1950s, where he and his wife founded Cosanti, handcrafting one-of-a-kind earthen and bronze wind chimes. 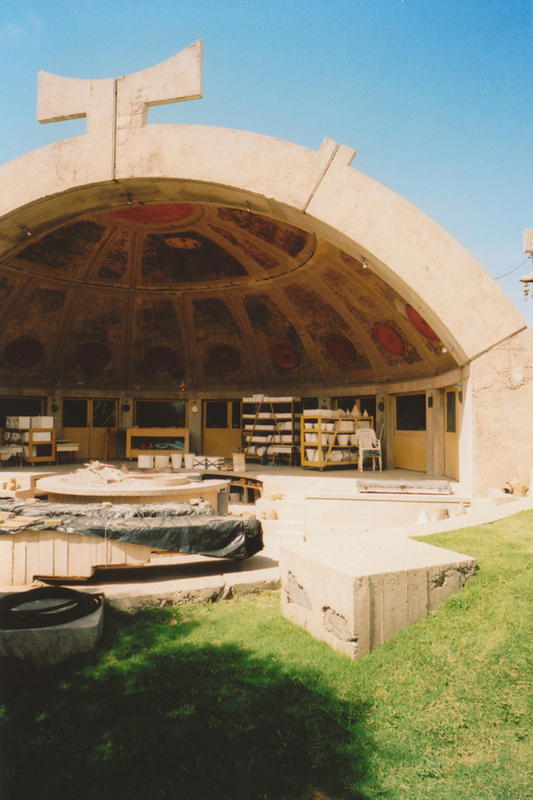 The business helped to finance his architectural endeavours, leading ultimately to the founding of Arcosanti. He created notable works of of public art, appeared in numerous films, and won numerous awards over the course of his career, including the Lione d’oro at the 2000 Venice Biennale d’Archittetura. A new film The Vision of Paolo Soleri: Prophet in the Desert was completed earlier this year and has been screened in select cinemas. 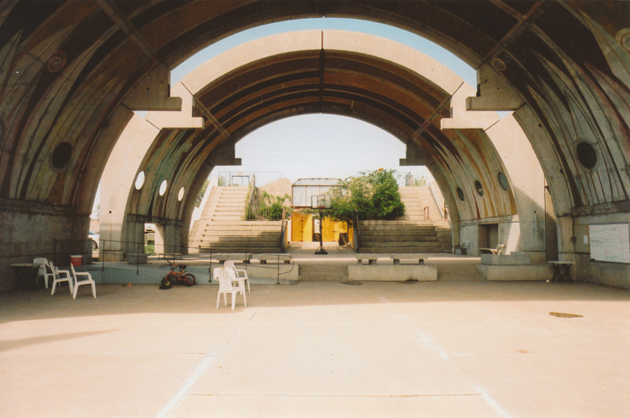 Sadly, his landmark amphitheatre in Santa Fe was recently demolished to make way for more utilitarian buildings. Our sincere condolences today to the Soleri family and the Arcosanti community.